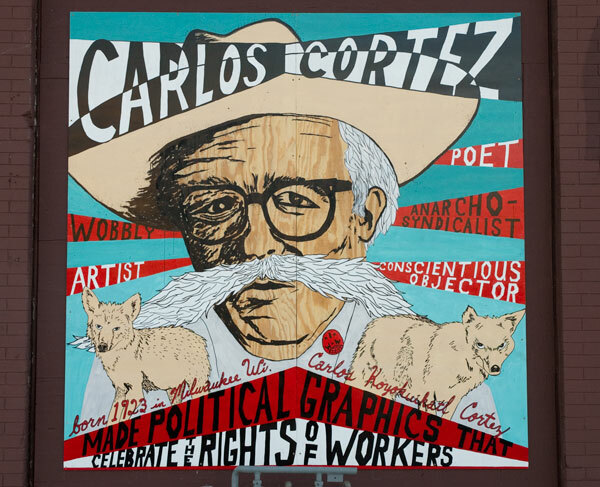 An obitatury for long-time IWW member and artist Carlos Cortez. “When you do a painting that’s it, it’s one of a kind. But when you do a graphic the amount of prints you can make from it is infinite. I made a provision in my estate, for whoever will take care of my blocks, that if any of my graphic works are selling for high prices immediate copies should be made to keep the price down. Carlos Cortez was an extraordinary artist, poet, printmaker, photographer, songwriter and lifelong political activist. His mother was a German socialist pacifist, and his father was a Mexican Indian organizer for the Industrial Workers of the World (IWW), also known as the Wobblies. Carlos was a Wobblie until he died. He spent two years in prison for refusing to “shoot at fellow draftees” during World War II. When the price of linoleum became too steep, Carlos started using wood. Used furniture was easy enough to find in any alley. “There’s a work of art waiting to be liberated inside every chunk of wood. I’m paying homage to the tree that was chopped down by making this piece of wood communicate something.” Carlos later became an accomplished oil and acrylic painter, though he always preferred the woodcuts because they were reproducible and affordable. When the Industrial Worker switched to offset in the 1960s, Carlos began drawing pen-and-ink cartoons. He has also served as editor of the newspaper and on the union’s General Executive Board, and was one of the IWW’s most popular public speakers. In 1985, to commemorate the union’s 80th anniversary, he organized an important exhibition, “Wobbly: 80 Years of Rebel Art,” featuring original works by many IWW cartoonists. Carlos was probably the only IWW artist whose work was exhibited at the Museum of Modern Art in New York. His art is exhibited throughout the United States, Europe and Mexico. Inspired above all by the work of José Guadalupe Posada, printmaker of the Mexican Revolution, and the German expressionist Käthe Kollwitz, Carlos blends the techniques and styles of the German expressionists with themes from the ancient Aztecs and modern Chicanos. He made countless images support striking workers, from miners in Bolivia to farm workers in California, though he is best known for large linocut poster-portraits of activists and labor organizers such as Joe Hill, Ricardo Flóres Magón, Lucy Parsons and Ben Fletcher. In 1998, the Center for the Study of Political Graphics honored Carlos Cortez with our “Art as a Hammer” Award for his inspired and inspiring use of art to create a more just world. He died in January 2005, in Chicago. He will be missed.